Vice President Leni Robredo on Friday sought reassurances from the Duterte administration that its martial rule over Mindanao would not be used as an instrument to orchestrate a return to a Ferdinand Marcos-style dictatorship. The vice president said she remained supportive of President Rodrigo Duterte’s decision to impose martial law to stave off terrorist threats in the strife-torn South, but added that she did not see any basis so far for it to be expanded to the regions of Visayas and Luzon. “Many are fearful [of martial law] because of our country’s experience with [human rights] abuses. Which is why, in our expression of support, we want to ask for assurances from the administration and the Armed Forces that what happened during the dictatorship would not happen again,” she said. Robredo made the remarks in an interview with local media in Bonot-Sta. Rosa, Camarines Sur, a transcript of which was sent to Manila reporters. 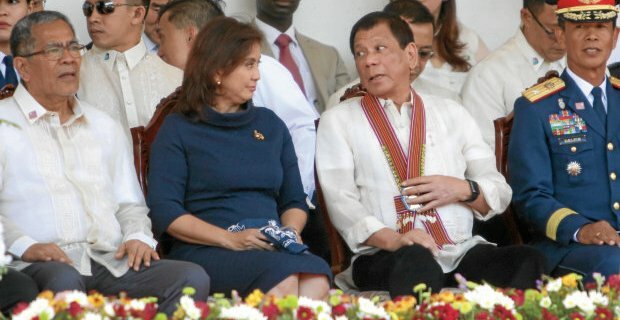 Robredo said she found it difficult to react to Duterte’s pronouncements on Wednesday as he was raising “only the possibility” of declaring martial law in the Visayas and Mindanao with no clear commitment. “In our view, there’s no reason to involve Visayas and Luzon,” the former Camarines Sur congresswoman said in Filipino. Robredo said she wished to remain supportive of the government’s efforts to pursue actions against terrorists and lawless elements in Mindanao following the siege of Marawi City by the Maute group this week. “We wish to be supportive of the administration because, with the severity of the terrorism problem, now is not the time to quarrel with each other,” she said. But at the same time, Robredo said many Filipinos were justifiably upset over the martial law declaration in Mindanao as it triggered harsh recollections of the country’s dark experience under the Marcos regime. “We will not allow this to be an instrument of violence. We will not allow this to pave the way for the return of the kind of leadership we fought in the past. I hope it does not return,” she said.